Ramen is one of the things I ate a lot of when I was younger as a gateway dish to eating out. I remember slurping up delicious bowls of it in Tokyo, and sought to find the same level of satisfaction back here in Singapore. Unfortunately, while there had been close contenders, none of them could compare. Is it the water? The noodles? The ingredients? I don't know. Anyway I gave up on ramen and now only visit Marutama, or what I'll call "basketball ramen" because of its sign at Killiney Road or Central at Clarke Quay, when the craving calls. I liked the simplicity of the thin ramen there -- plus the use of chicken-based broth. 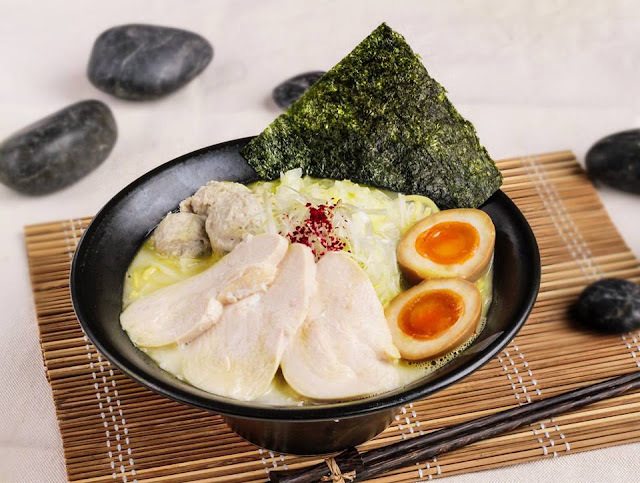 That's why I agreed to try out Torimaru, a new stall in the now empty Ramen Champion at Bugis+, which is known for their Tori Paitan (creamy chicken broth). Prices are very competitive, which you must have in Ramen Champion. I actually found most of the ramen in that arena to be too salty -- and what a way to do business by pitting very similar stalls selling almost exactly the same things side by side. I wished they could just disperse the 'losers' and keep it to one champion, since footfall at Bugis+ is hardly much. The chicken ramen comes in 3 flavours - regualr, spicy and shoyu. Then there's also the tsukemen, or dry version with dipping sauce. There is no pork or lard in any of the dishes from this stall, though I don't think they can claim to be halal due to the food environment! While ToriMaru serves as a good alternative to Marutama, especially for non-pork eaters, I'll say that not everyone will be used to the chicken slices/meatballs that are used in the Tori Paitan Ramen and hence the neutral rating. Stick to ordering the tsukemen or plain ramen to get a taste of that collagen-rich chicken broth to be safe.